Notice how “urban” clothes, communities, music, culture, etc. all have similar qualities, but when you think of urban fantasy novels, the same doesn’t apply? Most urban fantasies go the way of YA dystopian novels in who the protagonists are and where the action takes place. So, it was refreshing to pick up an urban fantasy novel that was set in an actual urban community and featured the people of those communities. By that, I mean people of color. 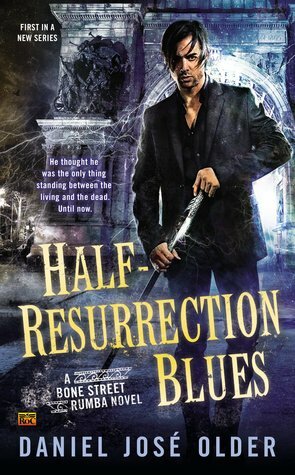 Half-Resurrection Blues is part ghost story, part mystery, written in a prose that in pure poetry in some places. Just the description of the ngk’s alone made me jittery. There’s no hand-holding here, no chapters and chapters of exposition. You are dropped right in the middle of Carlos’s chaotic life, in the middle of a Brooklyn that has it’s own hell mouth in Prospect Park. You’re learning the rules of being not-quite-dead just as Carlos is. There’s a bit of everything in this book — action, 100 pages still to go and Carlos is in an insane scene with the bad guy in hell/ghostly/underworld Brooklyn; love, though I wish Sasha’s character was more fleshed out and I hope we see more of her assassin side in future books; and commentary on life, death, race, and religion that doesn’t feel like you’re being preached to. Older’s Brooklyn is one that is real, for better or worse, and yet far more vibrant than the one I live in every day. Grand Army Plaza, Prospect Park, bodegas on every corner — this is all familiar to me. I lived on Empire Boulevard. But, the Brooklyn of Half-Resurrection Blues isn’t the one I know, but one I wish I did, ghosts, soul-catchers, and inbetweeners included.